House Accounts allow your customers to accrue a balance for goods sold that can be billed and paid at a later date. Start in the Management Console ([yoursubdomain].revelup.com). Go to your Settings tab and click Clear Selections. Type House Account into the search bar. Check the House Accounts box under Payments in the left menu. On the right side, scroll down until you locate the Payments section. House Account Enabled will allow the basic House Account functionality for all customers. 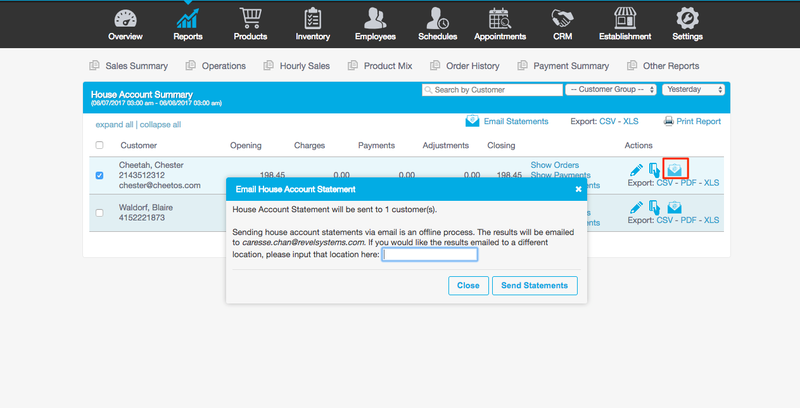 Enable by Default will automatically link a House Account to every customer. Default House Account Limit will enable a limit for every House Account. Email for Sending Statements allows you to enter your email information for sending House Account bills from the Management Console. On the Point of Sale, start by creating an order. 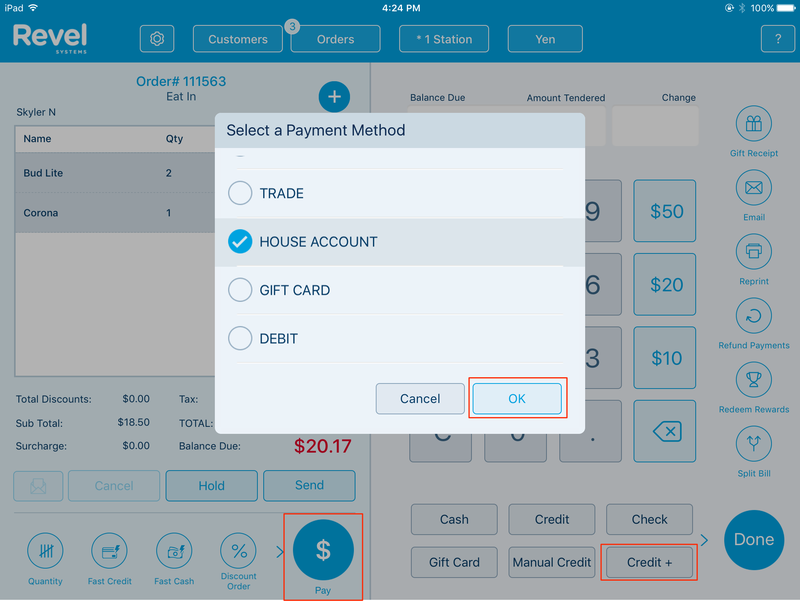 Attach a customer to the order by tapping Customers. Locate then tap the name of the customer. Tap Add to Order. Tap the payment button. On the Payment screen, tap Credit +. Choose House Account from the window. Tap OK to verify. You will see the current balance change to $0. The order balance has been transferred to the customer's House Account balance. Tap Done to close the order. To locate a customer's House Account details or to pay a balance, tap Customers. 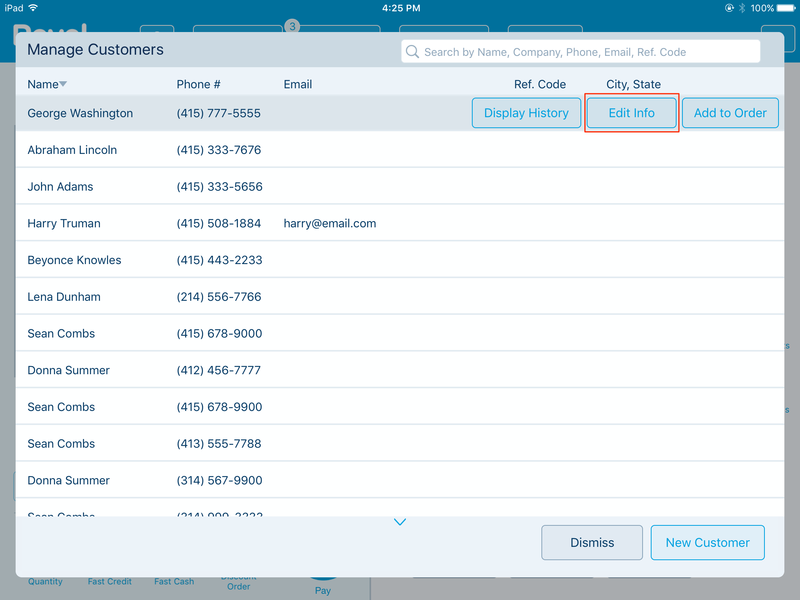 Locate the Customer, tap their Name, and then tap Edit Info. Tap House Account on the bottom left corner. 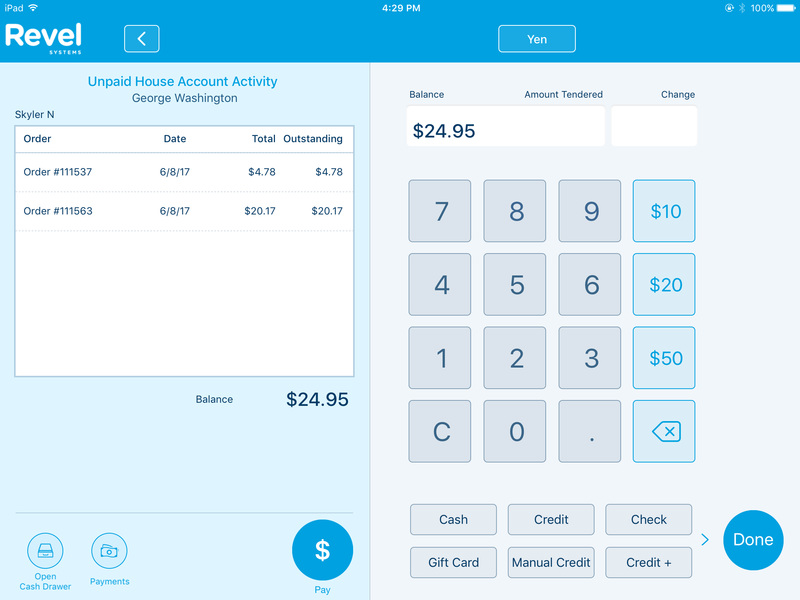 On the left side, you will see all unpaid House Account transactions as well as a total balance. On the right side, you can make a payment to the current balance. Partial payments or full payments are both acceptable. When you are finished, tap Done to close the screen. You can send personalized bills to your customers that contain their House Account balances. House Account bills can be sent directly from the Management Console. To send a House Account bill. In the Management Console, navigate to Reports. Hover over Other Reports and choose House Account Summary from the drop-down. Here, you will see a list of all customers with a current House Account balance. In this report, you can view the Orders, Payments, and Adjustments your customers have made to their balances. You can edit the current balances using the Pencil icon and record payments using the Credit Card icon. To email a House Account bill to a single customer, click the Coin Purse icon to the far right of the customer’s name. Then click Send Statements from the window. To send House Account bills to multiple customers at once, check the boxes to the left of the customers’ names, then click Email Statements in the top right side of the report. Click Send Statements from the window. The House Account Summary report will provide a detailed summary of all related activities, including house account payments, charges, adjustments, and the opening and closing balance of a customer. A House Account balance is considered liability. Payments against a house account balance can be found on both the "Sales Summary" and "Operations" reports in the Management Console. Pencil Icon: Adjusts Customer House Account Balance (manually increase/decrease). Payments Icon: Makes a Customer House Account Payment. Mail icon: Emails House Account Statement. Export icon: Exports the report as a CSV, PDF, or XLS file. "Order Payment" is the total amount for the order; "HA payment" is what was charged on the house account. House Account payments CANNOT be made in offline mode. Users can setup House Accounts in bulk using the CRM export/import feature. Before this can be done, the setting "House Account Enabled" needs to be enabled (checked) at EACH establishment that will be using House Accounts. Management Console> Settings> Payments> House Account. 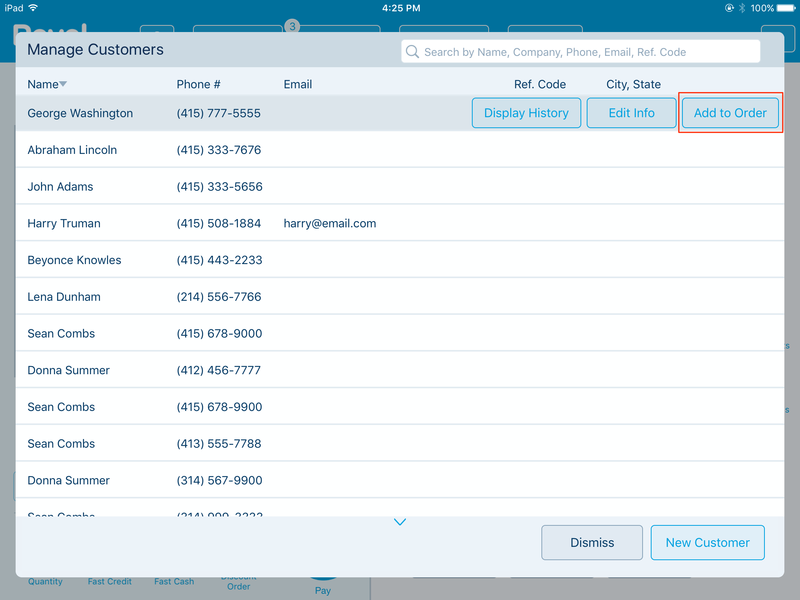 Once enabled, select the CRM tab, select Export/Import. Then select Export. An Excel file will be exported and saved to your downloads folder. Open the Excel file and fill in the desired data for each customer's House Account columns. House Account Enabled: Will be either "Yes" for enabled or "No" for disabled. If left blank, then it will default to what is already set on the Management Console per customer. House Account Balance: The starting balance due on the House Account: This allows you to set the starting balance for a customer's House Account. Do not have to be set and can be left blank if the customer does not have a starting balance due on their House Account. House Account Max Limit: The maximum limit that the customer can charge onto their House Account. If this is not set, then it will default to the limit set on the setting. If there is no default value set then this filed MUST have a value entered. *Please note that you cannot import this data via EMS. You also cannot setup House Accounts for multiple establishments at the same time by entering multiple establishment IDs in the Establishments column on the spreadsheet. If there are additional establishment IDs listed in the Establishments column, you will receive an error. Thedata will NOT be imported or updated. House Accounts can only be setup per establishment. So if you wanted to have the customer setup with a House Account at more than one establishment, import the file into each desired establishment. Once your import file is setup correctly, you can import the file into the desired establishments by going to the CRM tab and selecting Export/Import. Select Choose file, attach the exported and updated spreadsheet, and select Import. You will receive an import results email confirming if the import was successful.